With the numerous types of attachments that are out there, customers are finding new ways of adapting CTLs into their business, and the machines’ popularity continues because of it. There continues to be an upward trend in demand for compact track loaders (CTLs), which is shifting sales away from skid steers in the marketplace. CTLs not only have a seat at the table among different machines in the industry, but they are at the head of it. According to EDA, CTLs ranked as the No. 1 construction machine in terms of sales in 24 states from Oct. 1, 2015, to Sept. 30, 2016. All signs point to these machines continuing to gain market share from skid steers. With the numerous types of attachments that are out there, customers are finding new ways of adapting CTLs into their business, and the machines' popularity continues because of it. This is happening in all sectors from construction to forestry, landscaping and agriculture. Recently, there has been an increased demand for CTL's with higher rated operating capacity (ROC). This is largely due to their flexibility on demanding job sites and their ability to utilize a wide variety of attachments. Their agility, high tractive effort, breakout forces, low ground pressure and auxiliary hydraulics for various attachments, in addition to easy hauling to job sites, makes them convenient and profitable assets. It is crucial to make sure you are operating the right size CTL for the job by checking the ROC of your loader versus material weight and attachments that you will be working with. It is important to know both the limitations of the machine and all operational functions in order to operate the loader safely and effectively. Secondly, know your application. While CTLs are found in some hard surface applications — such as running a cold planer, which provides a rigid and stable platform — loaders are generally better for unstable, varied terrain. Tracked undercarriages will incur higher ownership and operating costs than a rubber-tire machine, especially when used in the wrong application. When purchasing a CTL, the owner should always consider track, roller, idler and sprocket costs — all which impact the bottom line. Turning on hard surfaces and running a CTL on rocky ground or demolition-type applications can greatly reduce the life of the track and undercarriage components. This is where the rubber-tire skid steer still has a place. Those same ground conditions are still tough on tires, but it is much cheaper to replace tires than tracks. Most areas have been taken over by the track loader because of higher production as well as the ability to operate much better in soft and muddy conditions. As long as there is dirt to be moved, and new applications and attachments for these versatile machines, there is no end in sight to the CTL's popularity. At the end of the day, there is no doubt that utilizing these versatile machines in the correct applications will result in a profitable return. 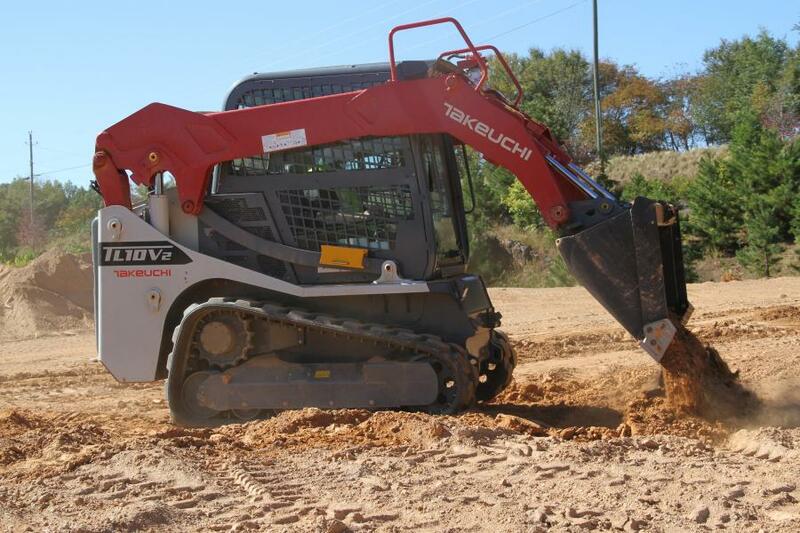 Michael Shebetka is a product and training manager at Takeuchi-US.